This trip takes us back to Mississippi to attend two separate Cook Family Reunions. Lawson's grandfather John only had one brother, Richard. The Richard Cook descendants have their reunion every even year in Preston, MS. The John Cook descendants have recently been meeting every year in the Jackson, MS area. By taking the 5th wheel, we were able to spend a few days visiting some sites of interest in the week between the reunions. The weather was still pretty nice for outdoor activities before the oppressive summer heat sets in, so we were able to accomplish our goals. We hope you enjoy our trip too. [Thursday] May 31st we left Richmond bright and early, about 7:45 AM, because we were going to make a stop at Kay's office so she could meet with a client for Cook Counseling before we left town. We fought the rush-hour traffic with a few million more Houston commuters and arrived at her office at the intersection of Kirby and Bissonnet right at 9 AM. We left her office at about 10:30 AM and started east on IH-10 toward Louisiana. 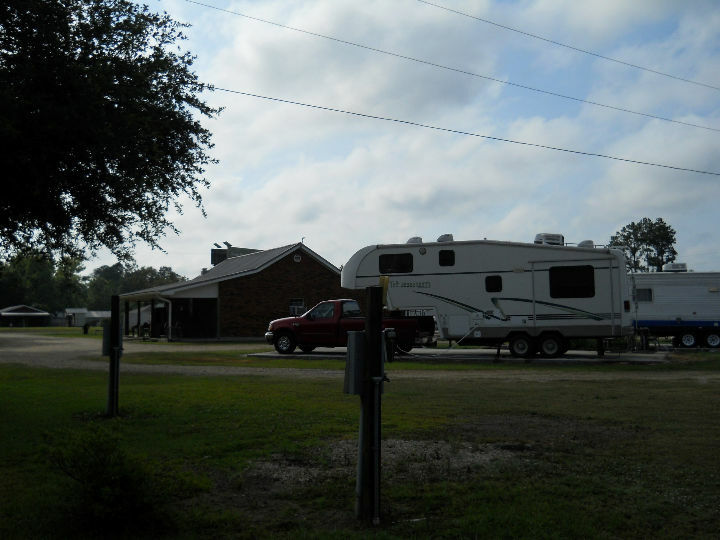 We made it to Hammond, LA about 7:00 PM and pulled into Punkin Park Campground for the night. It was a good place to spend the night, but was a little noisy from the freeway traffic. We arrived after a storm had come through with quarter-size hail, according to the lady at the park. Good timing. Please wait for the small photos to load. Then click on a small photo to see it enlarged. [Friday] Another day of driving was in store, so we got an early start, around 8:30 AM and traveled north on IH-55 to Jackson, MS, then IH-20 east to Forest, MS. At Forest, after a stop at Walmart, we went up MS-21 north to Philadelphia, MS, then MS-16 & MS-397 to Kemper County Lake and our campsite #13. After setting up camp we drove over to the lake to register and look around. 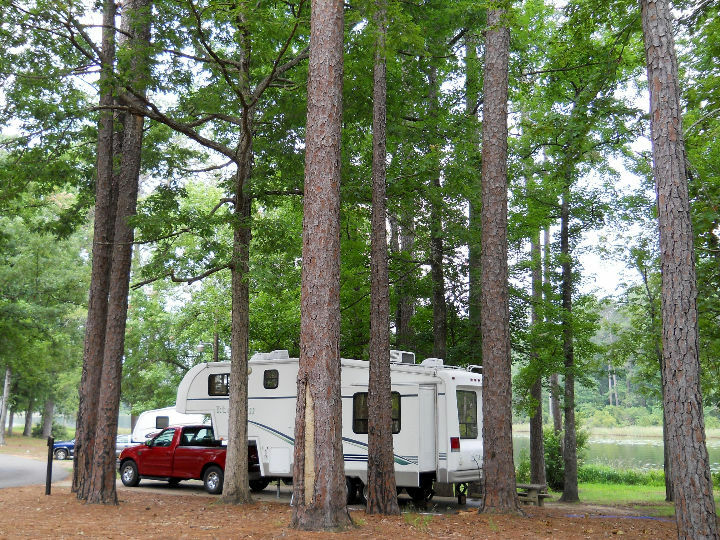 Kemper Lake Campground is a great clean place to camp. 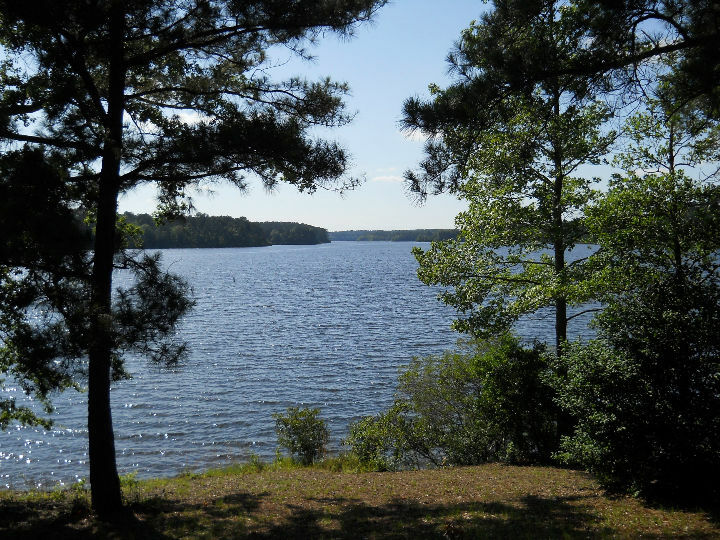 This is the second time we camped here and it is well maintained and Kemper Lake is a nice clean sandy bottom lake. 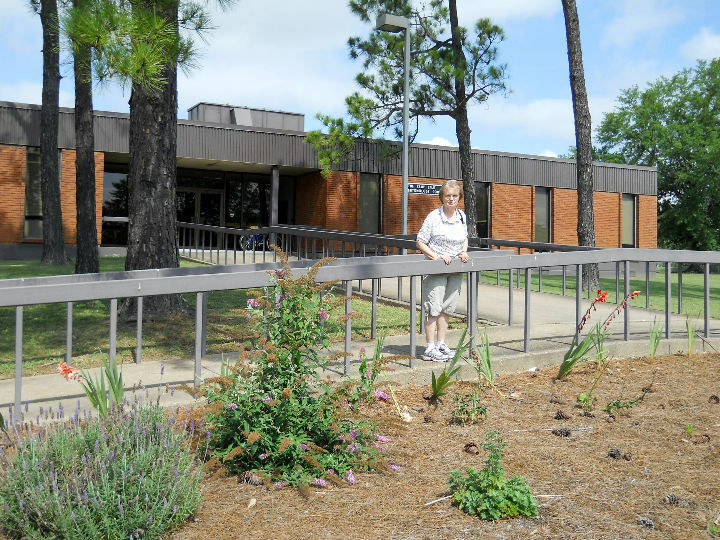 Facilities are top notch for a county park. 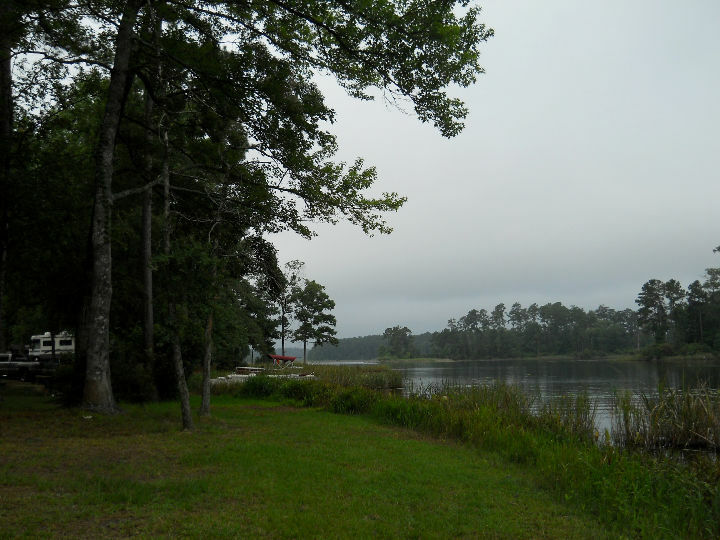 < Our Kemper Lake Campground site. < Kemper Lake. 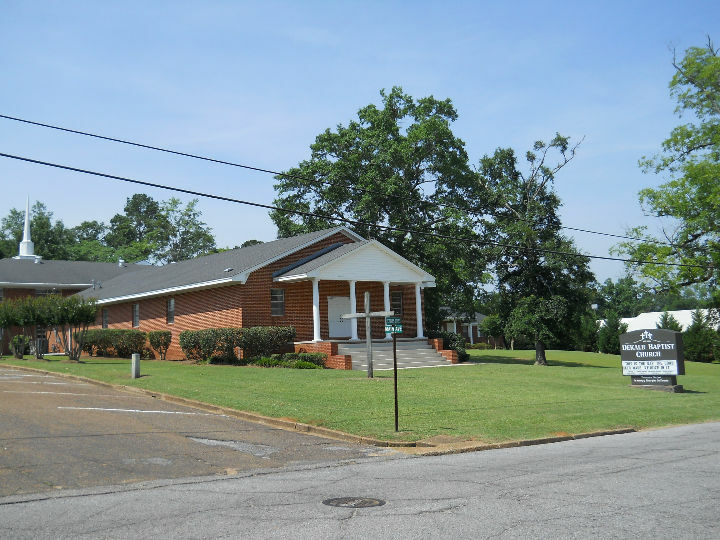 [Saturday] Today is the Henry Richard Cook Reunion in Preston, MS. We drove the short drive from the park to Preston and the Masonic Lodge. As we arrived about 11:45 AM, they were starting to eat at the potluck dinner. There was lots of food and we visited with some of our distant cousins for a few hours. After the reunion dismissed, we joined Lawson's sister, Faye and husband Ray, to visit Preston area cemeteries to look for relatives. We found some and noted for our records. The weather was nice and cool (upper 50's at night & mid 80's day), so we enjoyed being outside. After we got back to the park. We walked around the park next to the lake until sunset. < Henry Richard Cook Family Reunion. [Sunday] In the morning we attended the 11 AM service at DeKalb Baptist Church. The folks were very friendly and welcoming to us. The pastor, Rev. James Ruffin, delivered an inspiring sermon from IITimothy 4:9,21 entitled, "Come Before Winter." 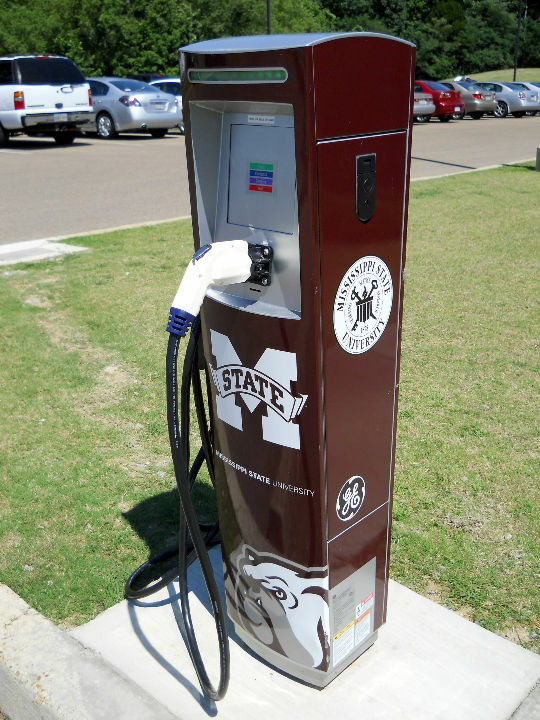 After lunch, we traveled up MS-397 to Louisville, then MS-25 to Starkville and Mississippi State University. 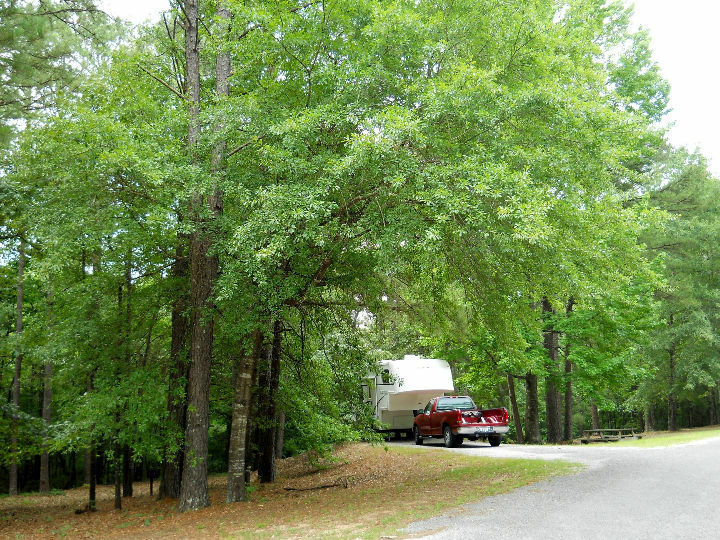 We set up camp at Indian Mound Campground in site #24. After we got settled in, we still had time to drive over to the MSU campus and walk around the campus before dark. The campus was almost deserted, since it was the weekend just before the summer school was to begin next day. It was a good time to drive/walk around without hindrance, except the buildings were locked. < View of MSU campus from West entrance. 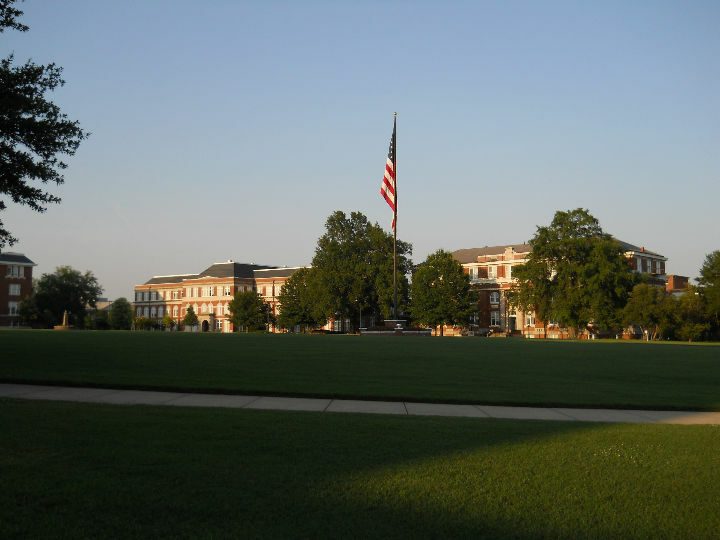 < Lee Hall on MSU campus. < YMCA Building. 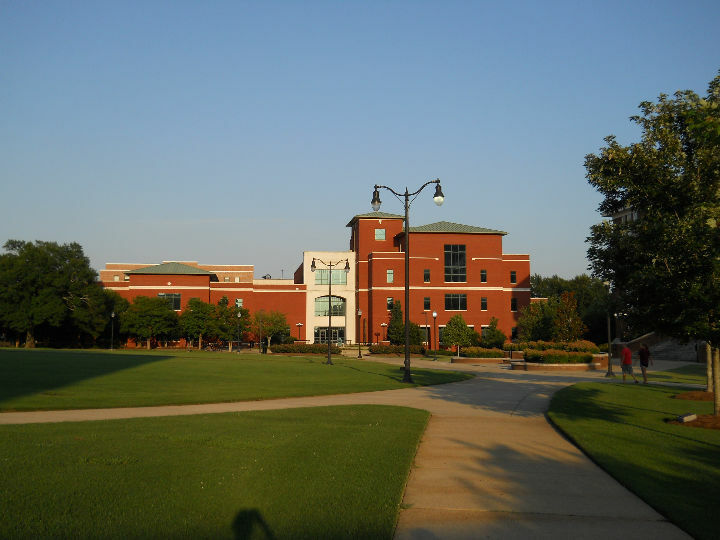 < McCain Hall & Carpenter Hall Engineering Bldgs. 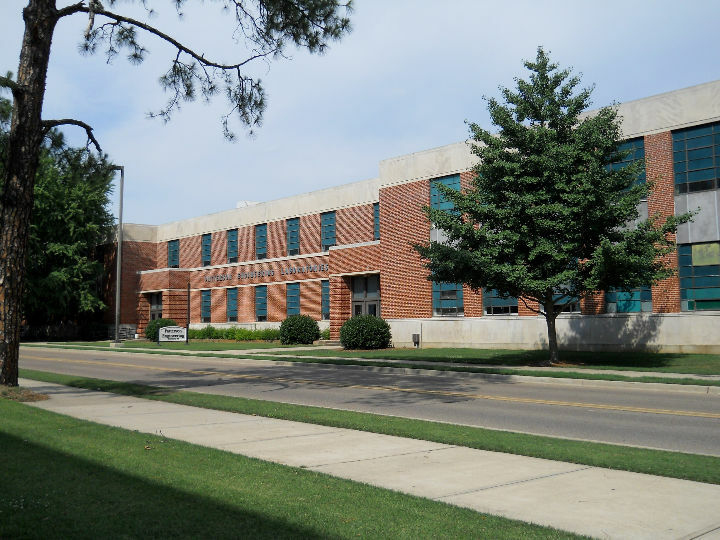 < Swaim Hall Chemical Engineering. < Patterson Engineering Lab. < Familiar site back in the early years. 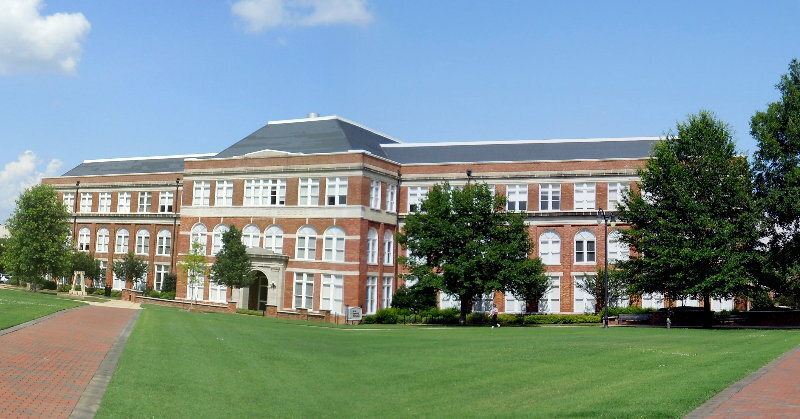 < Montgomery Hall. [Monday] We were awakened to the sound of raindrops on the trailer. 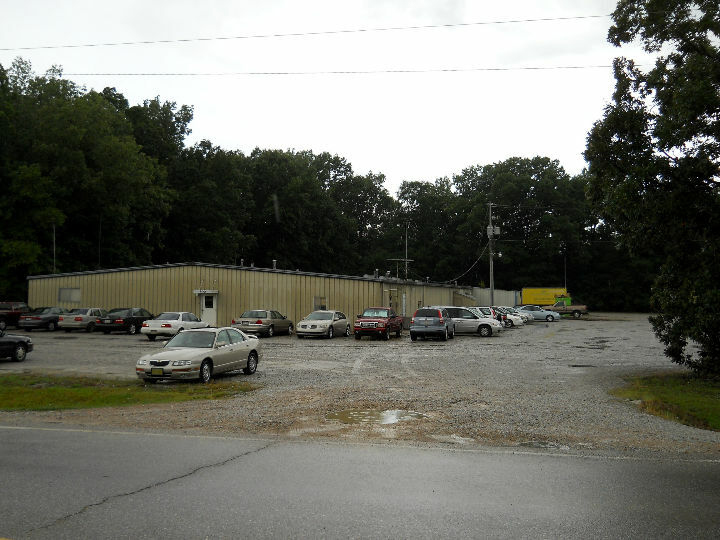 After breakfast, a rain storm moved through, but had become less heavy by about 10 AM, so we decided to go look up MFJ Enterprises, a Ham Radio accessories manufacturer headquartered in Starkville. We located the rather sad looking unmarked building and decided to go in and see what we could find. 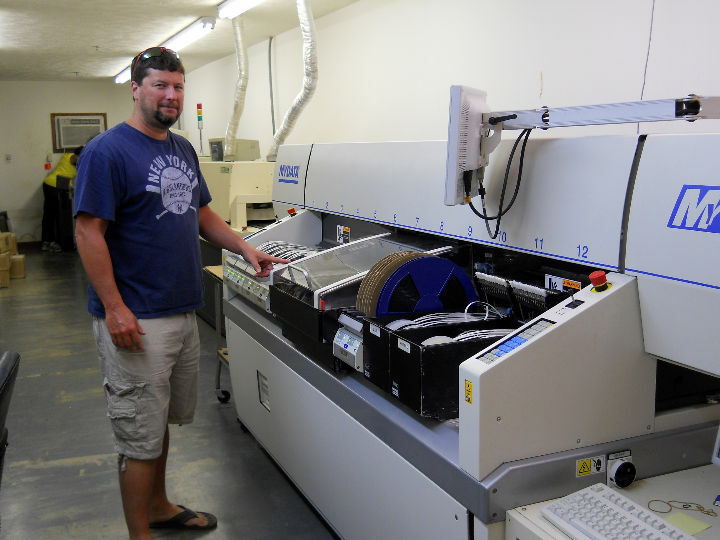 We found a friendly staff that offered us a guided tour of their facility. It was quite amazing to see how few people are involved in the construction of the equipment, even though it is mostly hand assembled. It was an interesting tour and well worth the stop. 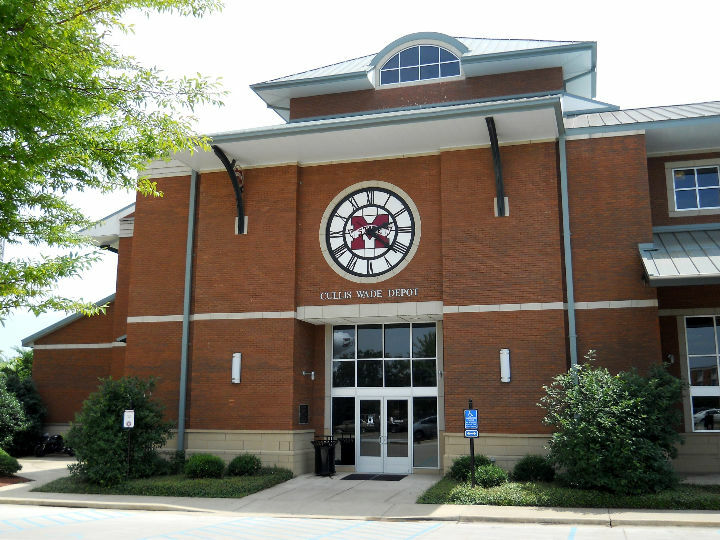 After lunch, we went to the Cullis Wade Depot, which houses the MSU Welcome Center and picked up information and saw a short video promoting the University. 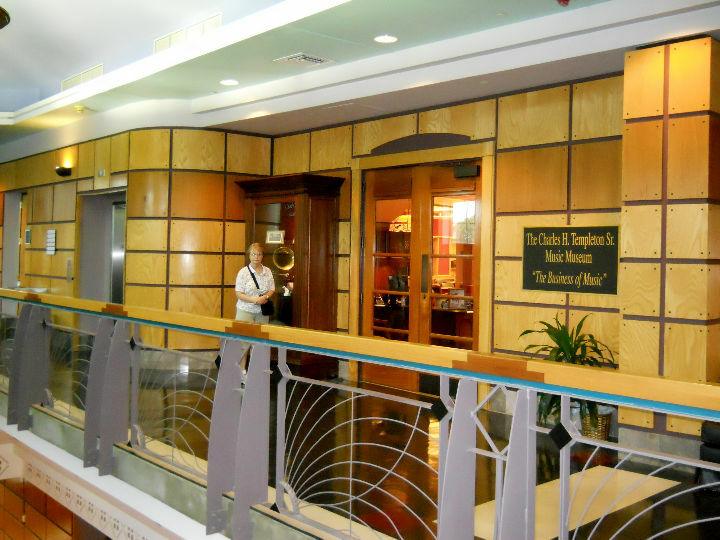 Afterwards, we went into the Cullis and Gladys Wade Clock Museum, a collection of more than 400 clocks representing nearly every American manufacturer. Probably about 1/3 of them were ticking, sounding like raindrops on a tin roof. 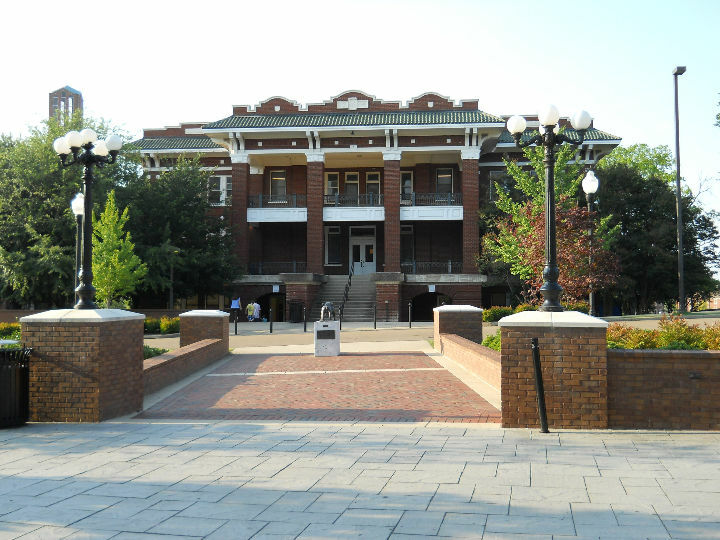 < MSU Welcome Center at the Cullis Wade Depot. 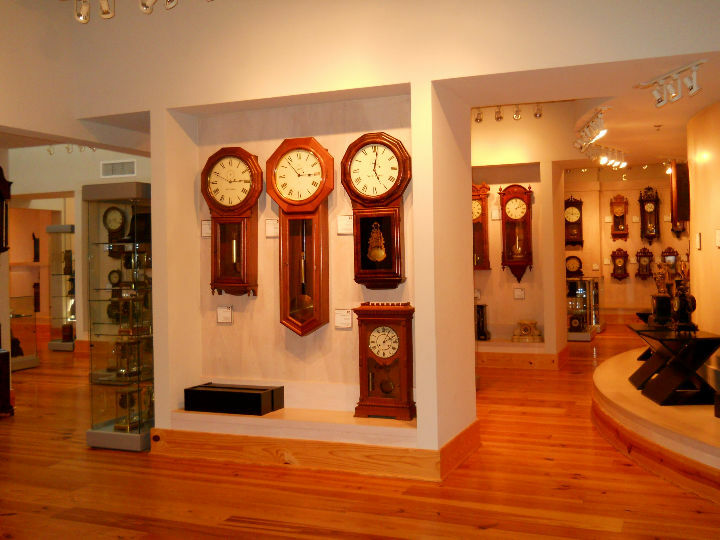 < Cullis & Gladys Wade Clock Museum. We then took the short walk to the center of the campus. 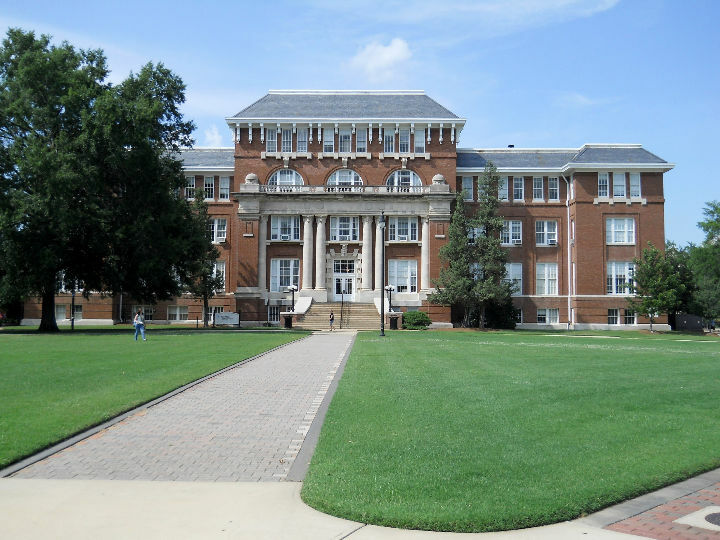 We walked through several of the engineering buildings, including the building that Lawson took his first Electrical Engineering class in. After extensive modernization inside over the years, there was no resemblance to the old inside, although the outside looked just like 50 years ago. We closed our afternoon of walking in the Colvard Student Union to enjoy an ice cream cone before we went back to the RV park. < McCain College of Engineering. 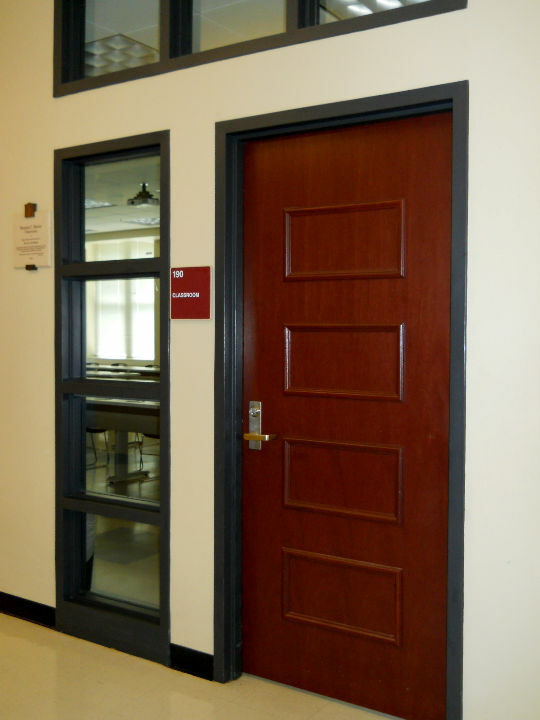 < Door to room of Lawson's first EE class. 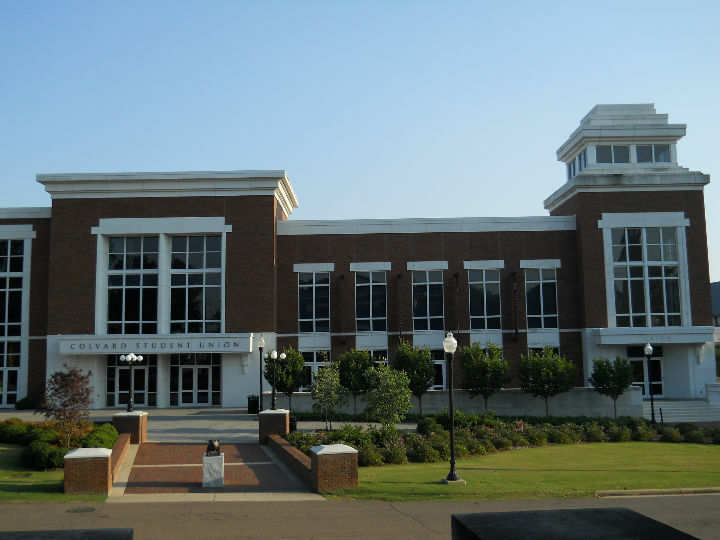 [Tuesday] In the morning, we drove to the MSU campus and visited The Mississippi Entomological Museum. The museum director, Dr. Richard Brown, gave us a very interesting and informative tour of the museum and his research lab. They have thousands and thousands of specimens mounted and catalogued. He introduced us to many of the research associates and technicians and showed us the work they were performing to benefit humanity. < Clay Lyle Entomology Lab. 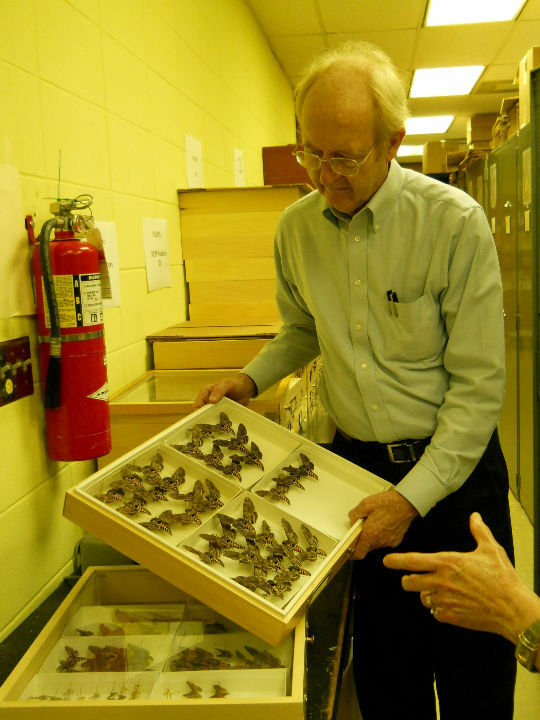 < Dr. Brown shows us the moths of the tomato hornworm. 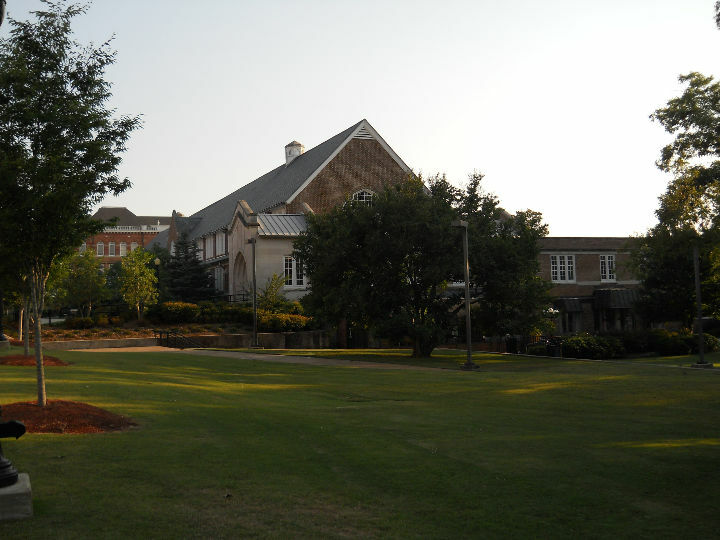 We then walked to Lee Hall, which used to be the administration building when Lawson attended in the 1960's. We walked the halls inside the building. 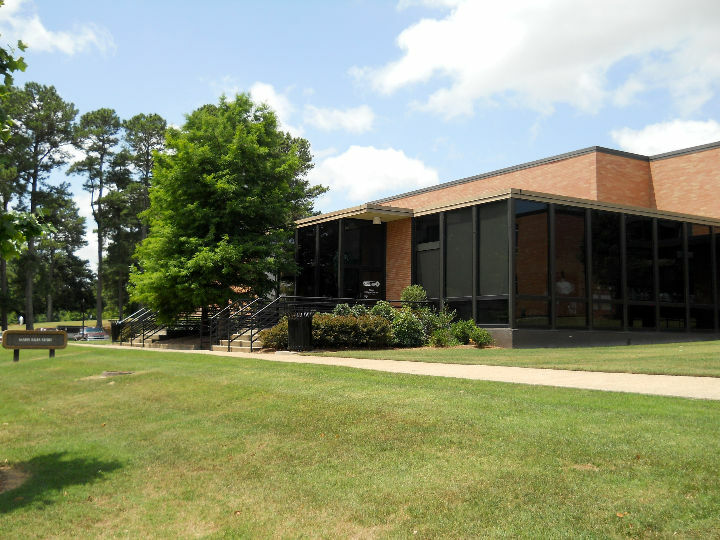 The offices were being vacated so the building can be renovated inside and out. 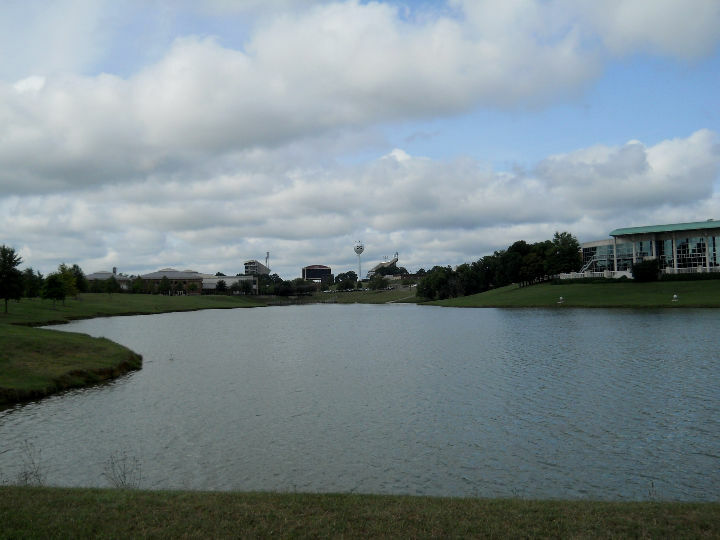 It will be completed around 2014, depending on money from the state legislature. It was about 12:30 PM, so we went over to the Colvard Student Union building to eat lunch. We wanted to eat in the Perry Cafeteria, the old cafeteria when Lawson was in school, but it was not open during the summer session. The only places to eat were in the Student Union, Chick-fil-a and Panda Express. Panda Express won out because Lawson loves Chinese food. < Perry Cafeteria. < Colvard Student Union. After lunch we walked across the drill field to the Mitchell Memorial Library to visit The Charles H. Templeton, Sr. Music Museum. 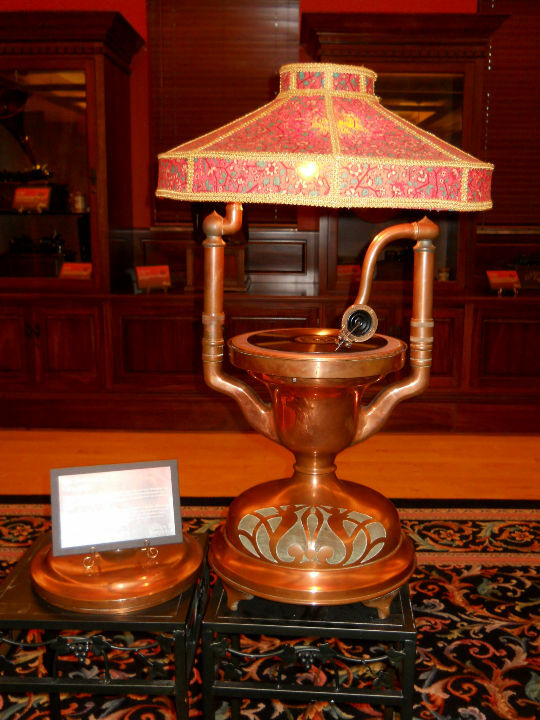 This collection includes musical instruments, records, and sheet music amassed over four decades. 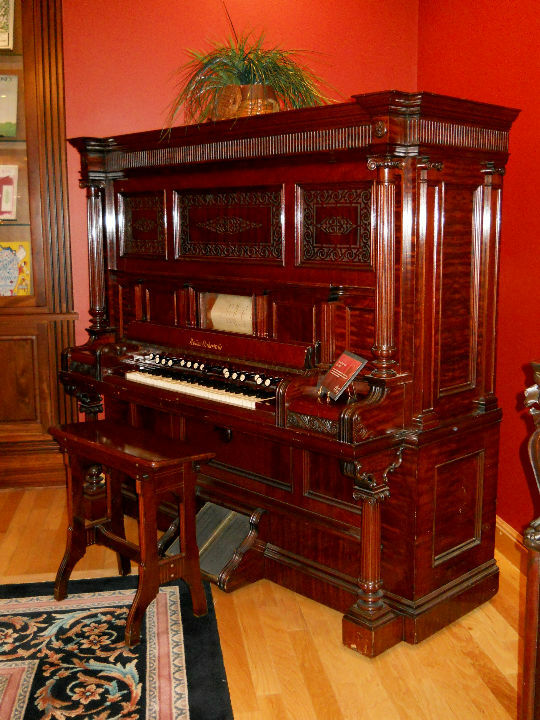 Many of the 200 musical instruments, 22,000 pieces of sheet music and 13,000 recordings that Templeton donated to MSU in 1987 are on display in the museum. < < < < Templeton Music Museum. 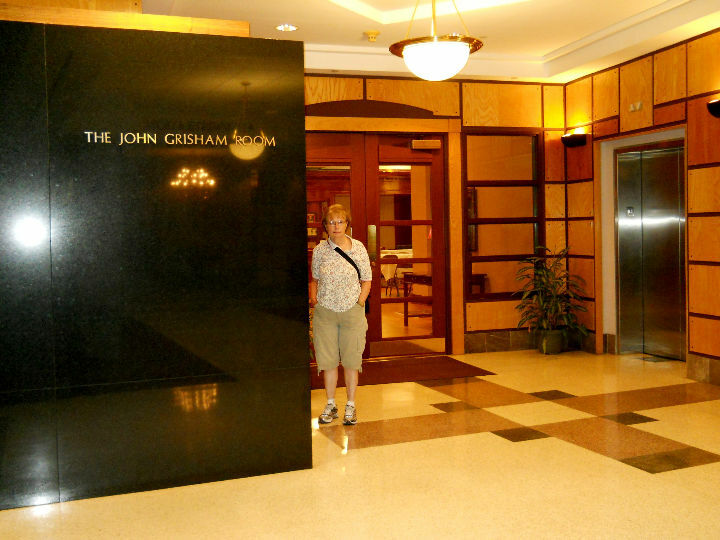 Also in the library is The John Grisham Room. On display there are memorabilia paying tribute to Grisham. < The John Grisham Room. 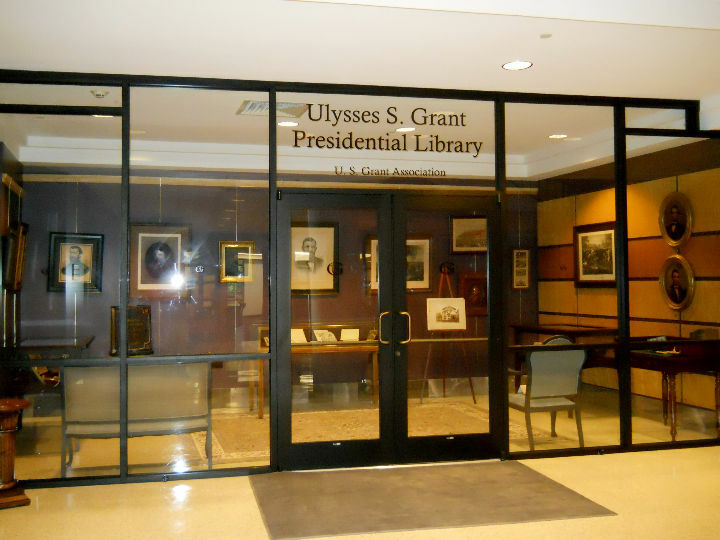 Another museum housed in the library is The Ulysses S. Grant Presidential Library. 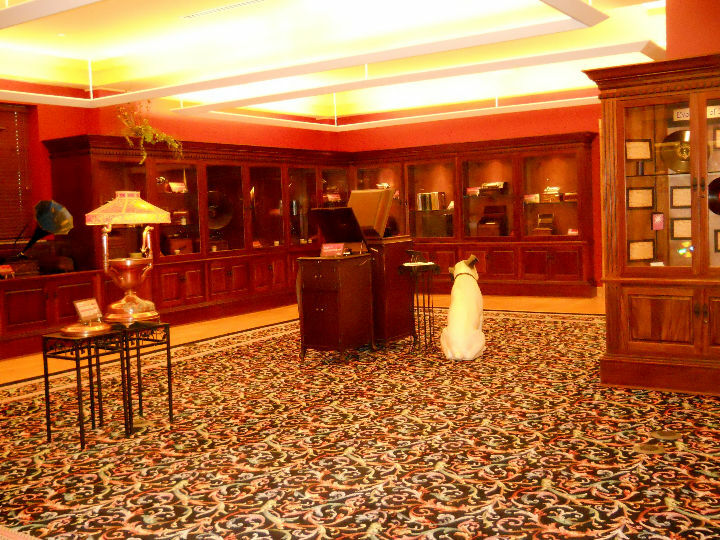 Only a few items owned by The Ulysses S. Grant Association are on display in the small room. One of the association personnel opened the museum and gave us a personal tour. They have plans for an expanded museum if the money comes in. < U.S. Grant Presidential Museum. 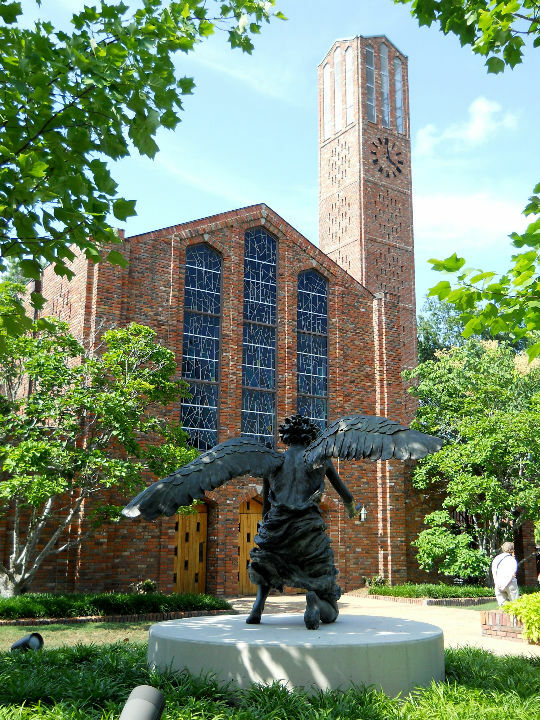 We then walked across the drill field and visited The George Perry Carillon Tower and Chapel of Memories. 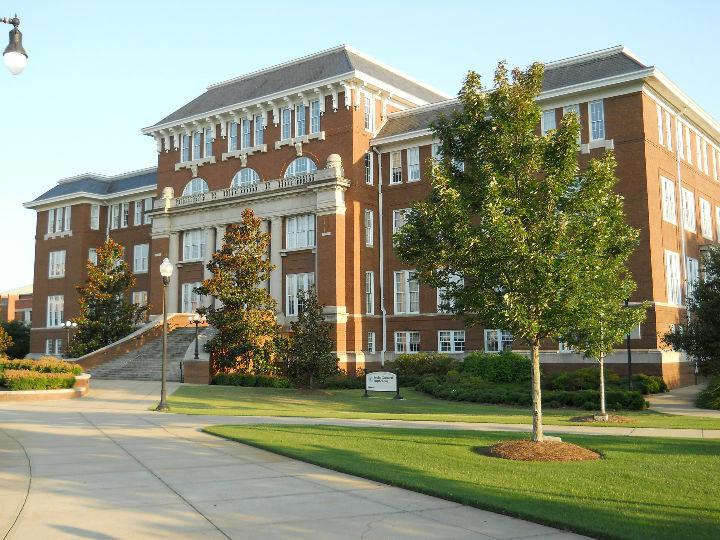 The buildings were constructed with brick salvaged from the Old Main Dormitory that burned in early 1959 and killed some MSU students. At the time it was the largest (or one of the largest) dormitories under one roof in the country. 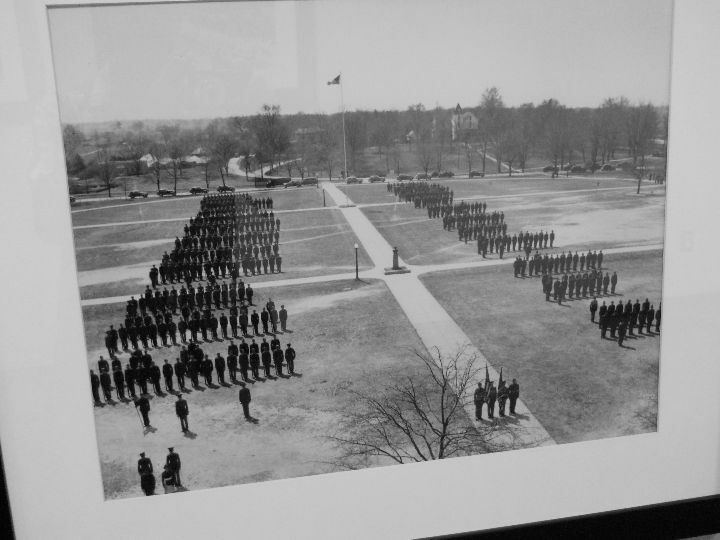 It burned less than a year from when Lawson probably would have been housed as a freshman in September 1959. 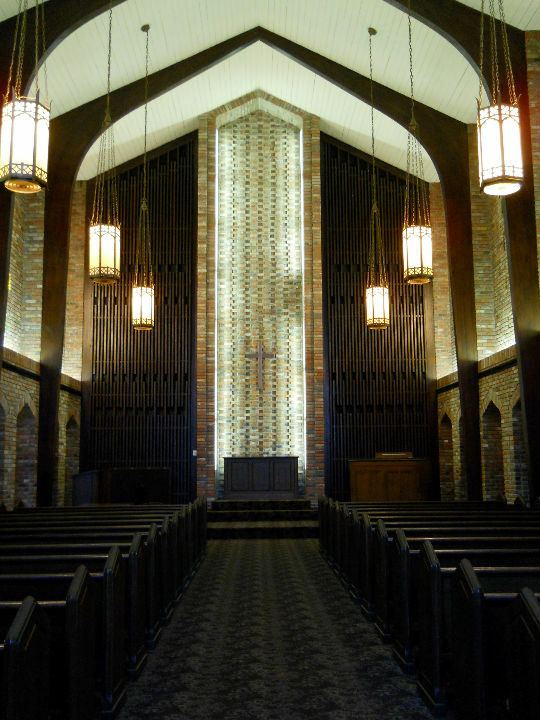 < < Chapel of Memories. We walked back over to the Cullis Wade Depot Welcome Center and viewed a Japanese art exhibit on the second floor. We might need more education to truly appreciate Japanese art. We then drove over to the Herzer Food Services building and the MAFES Store, "The Cheese Shop". 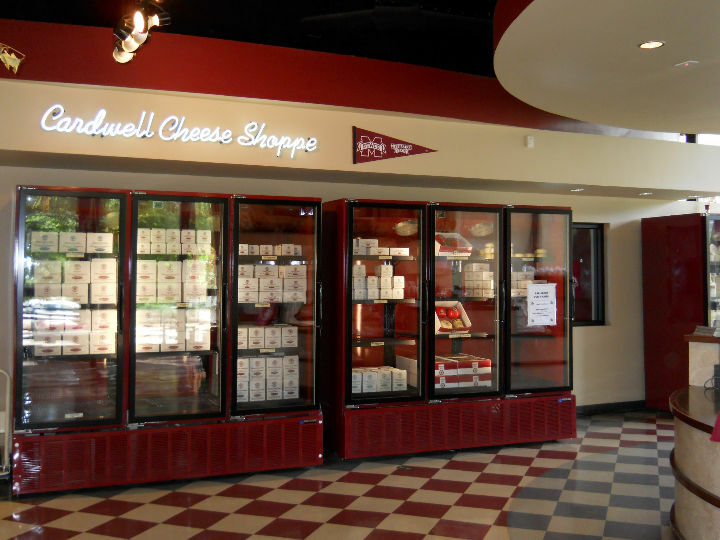 The MSU Dairy Department is famous in the state for their cheese and dairy products. Lawson remembered the occasional milkshake and banana split he enjoyed in the old store when he was a student. We bought some Edom cheese, milk and ice cream from the store. [Wednesday] In the morning, we drove from the park, stopping briefly at the Veterans Memorial Rose Garden. 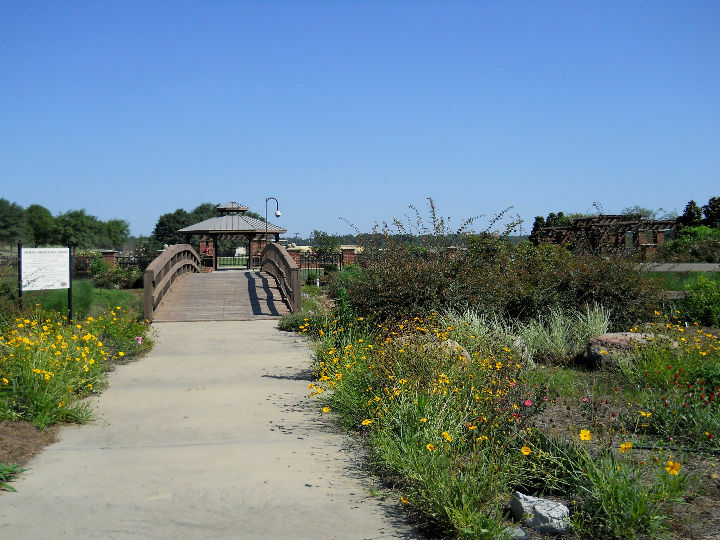 < Veterans Memorial Rose Garden entrance. Afterwards, we stopped at the Center for Advanced Vehicular Systems building and received a brief tour of the parts of the building that were open to the public. 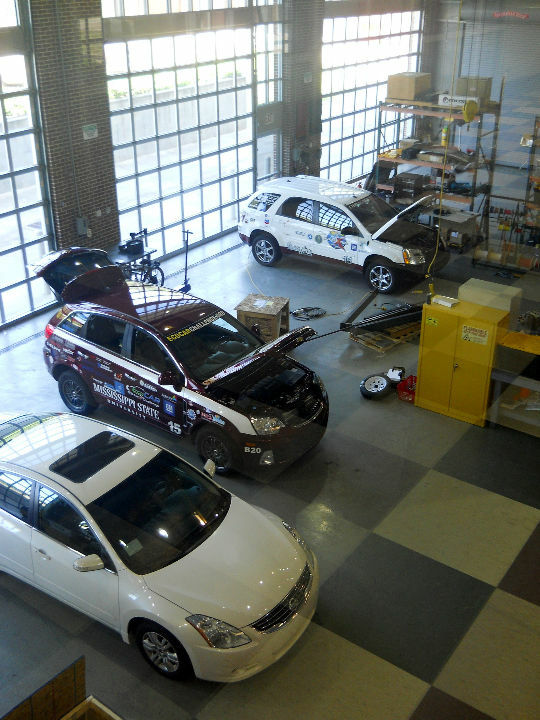 A MSU team of students from diverse career fields are competing with teams from other universities to achieve increased gasoline mileage and efficiency in test autos. 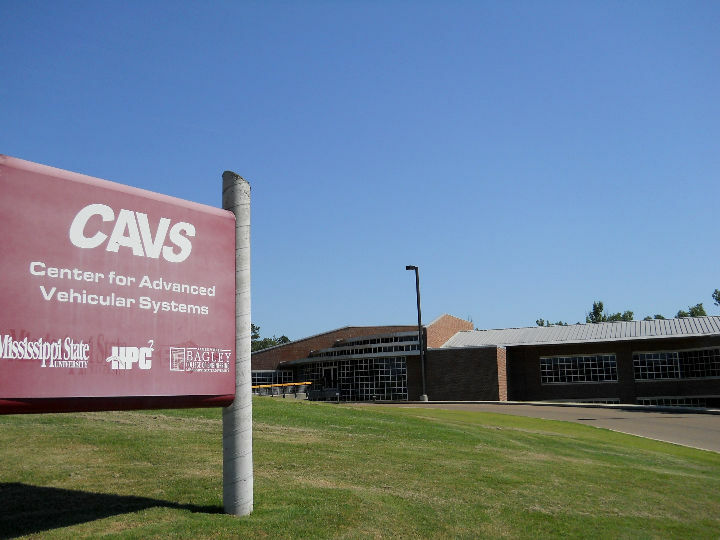 A friend's son attends MSU and works in the CAVS operations. < < Center for Advanced Vehicular Systems. < Electric car charging station. Next, we drove to Downtown Starkville. 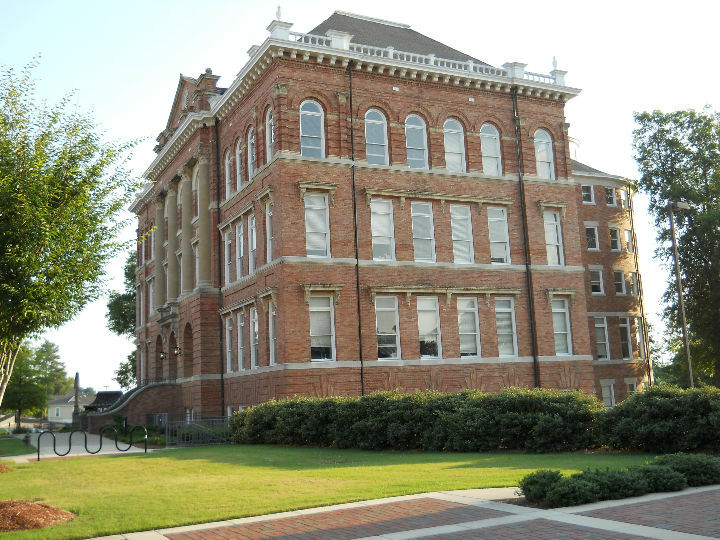 Starkville still has about 3 blocks of the old buildings that were there during the time Lawson was attending MSU. 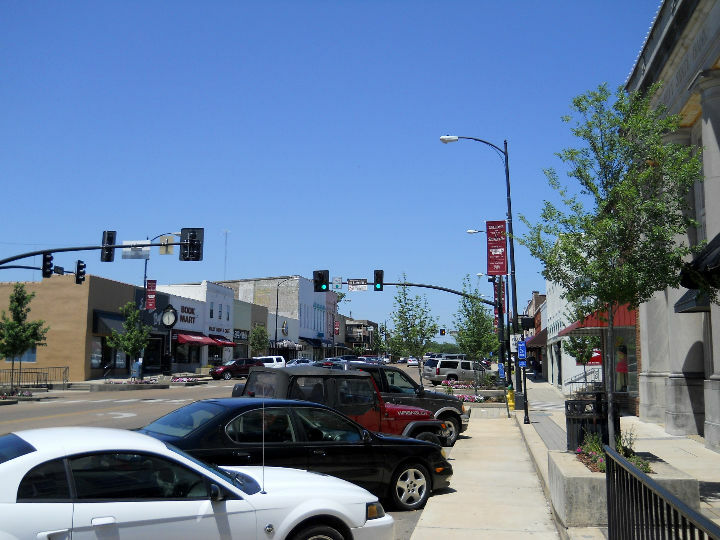 The downtown portion of Starkville seems to be doing very well, compared to many other small towns in the south. We walked the 3-block loop to see everything. 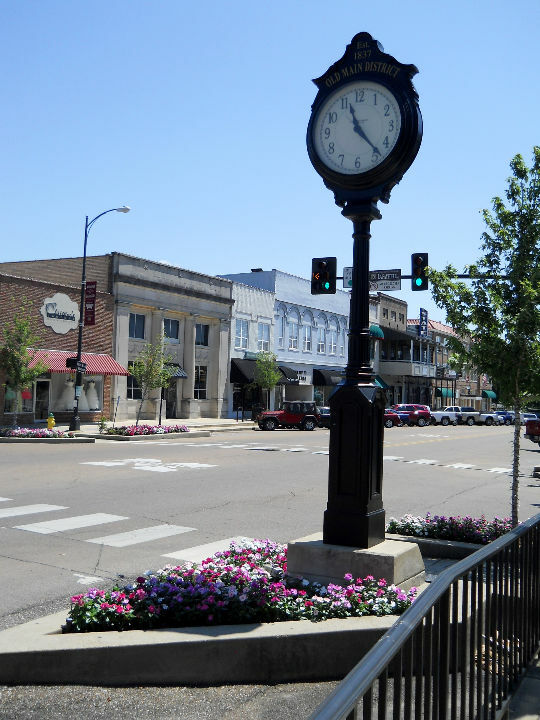 < < Downtown Starkville, MS.
After a brief stop at the Barnes & Noble at MSU store, we ate lunch at the trailer and pulled the trailer south on MS-12, the Natchez Trace Parkway and MS-16 toward Canton, MS., where we checked in at Movie Town RV Park, site #151. 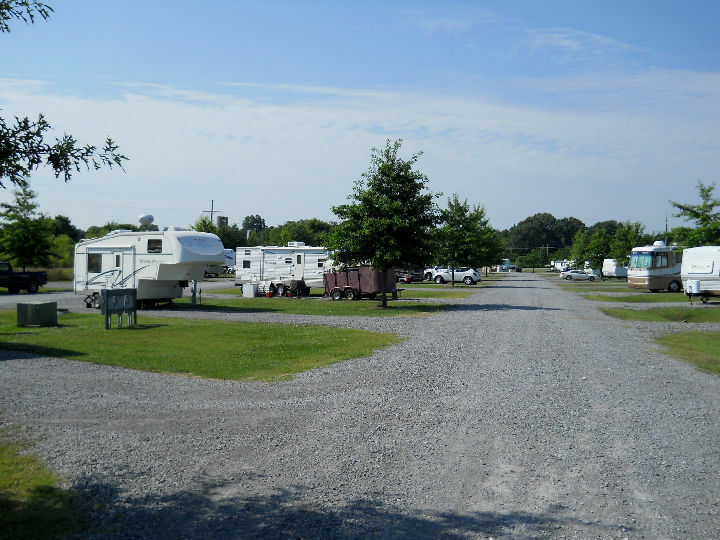 < Movie Town RV Park. [Thursday] In the morning, we drove around Canton to see Lawson's old hometown. We stopped by the Canton Cemetery where his mother and dad are buried. 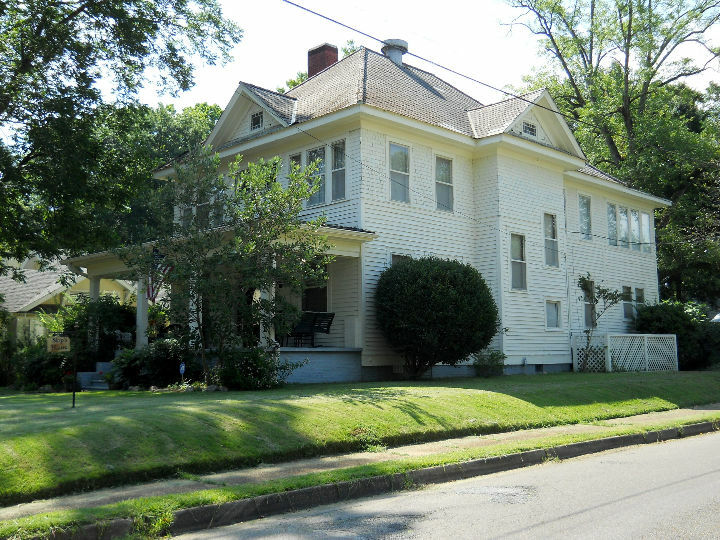 Afterwards, we drove by the old Canton High School building, Lawson's parent's home, the Canton Visitor's Center, and a few other sites of interest, including the locationss of some of the 7 movies that have been made in Canton. < Home used in My Dog Skip movie. 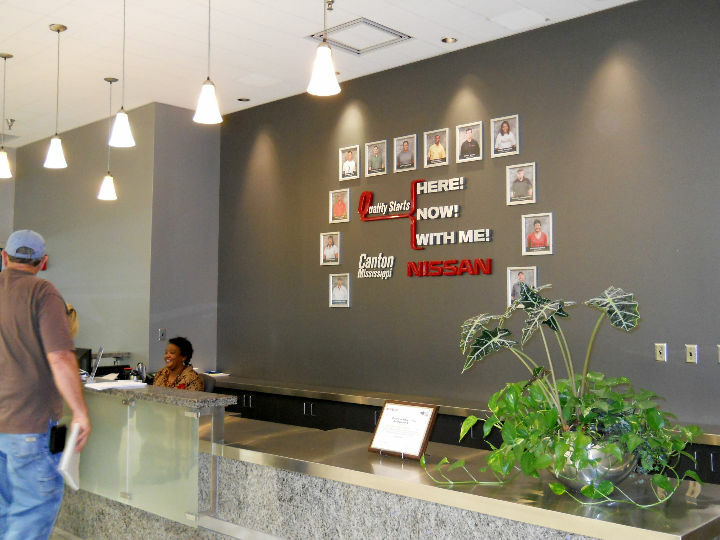 After lunch, we toured the Nisson Canton Assembly Plant. This is a $1.4 billion dollar, 3.5 million square foot plant on 1,400 acres, that started production on May 27, 2003. 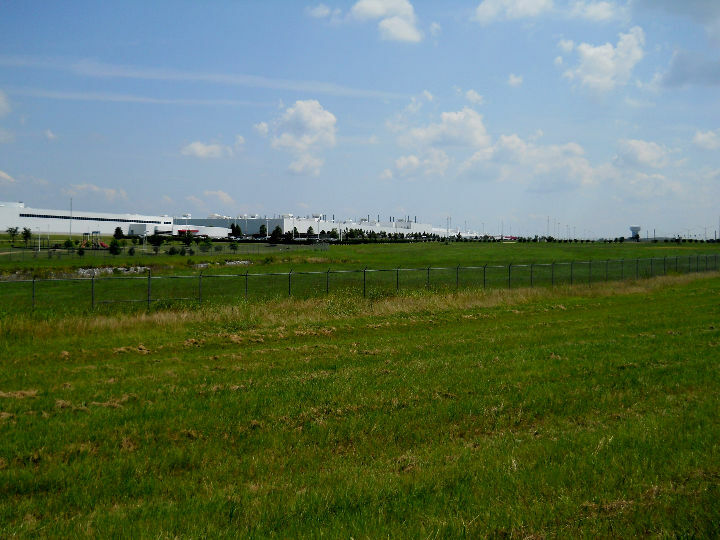 It has a capacity of over 400,000 vehicles per year. Our tour guide was very knowledgeable and kept us informed on everything we saw as we were transported about the giant factory on the electric tram. The tour was very interesting and well worth the time. Too bad we couldn't take photos inside the factory. 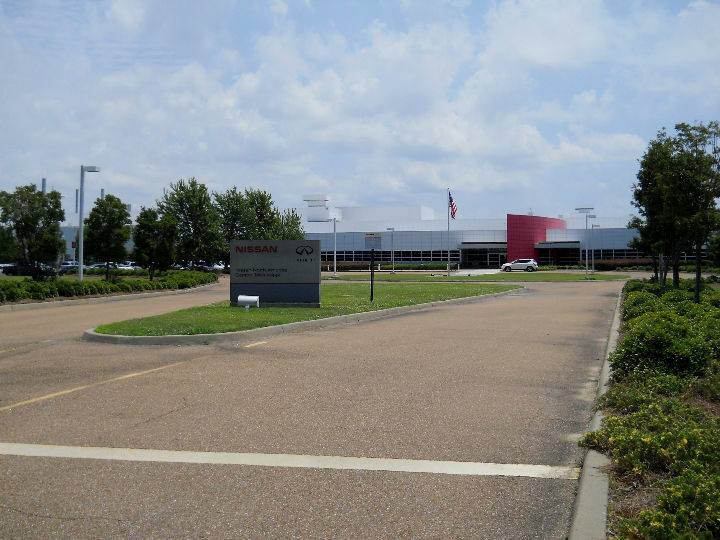 < < < Nisson Canton Assembly Plant. After we got back from the plant tour, we pulled the trailer down IH-55, IH-220 and MS-18 to Raymond, where Lawson's sister and brother-in-law live. We parked the trailer across the street in the driveway of a vacant house. We then attended the GED Graduation of Lawson's niece's daughter at Hinds Community College that night. [Friday] After breakfast, we went to a nearby farm of a friend of the family and picked blueberries from the large orchard. [Saturday] After breakfast, we rode with Faye & Ray to Penn's Restaurant in Brandon where the John William Cook Family Reunion was held. We enjoyed visiting with the relatives in attendance. 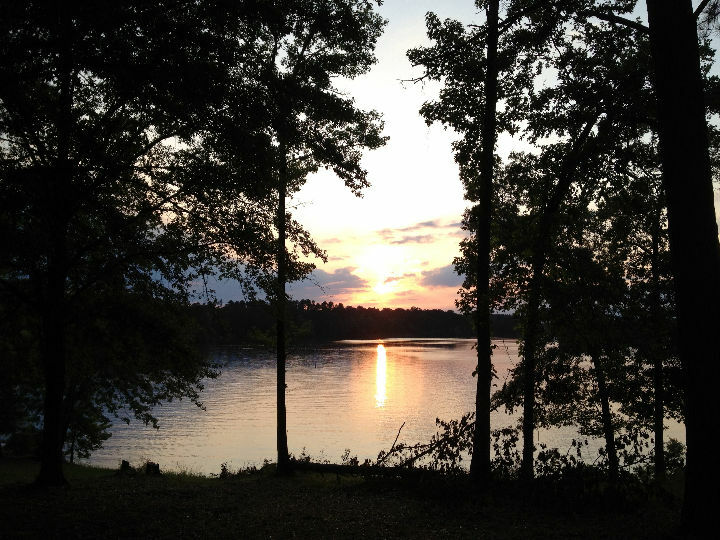 After returning to Raymond with Faye & Ray after the reunion, we started back toward Texas down the Natchez Trace Parkway south, crossing the Mississippi River at Natchez and stopping for the night at Indian Creek Recreation Area Campground near Woodworth, LA, southe of Alexandria. We were extremely lucky, arriving about 7 PM Saturday night to get a great campsite on the lake, maybe the last open spot. It is a beautiful park and was filled to the brim with families camping, since school was out for summer. < < Indian Creek Recreation Area. This draws to a close our visit to Mississippi for the Cook Family Reunions, with a brief interlude to look in on some of Lawson's old stomping grounds. We hope you enjoyed the photos and brief descriptions of our activities. God willing, join us again soon for another RV adventure.